ANDES have now run eighteen previous expeditions to the Puna de Atacama, since our first trip out there way back in 1993. There are many mountains in this remote but beautiful area that make good expedition objectives and still potentially many unclimbed peaks. The ascents in this area are all non-technical and so make ideal peaks for trekkers or walkers who want to get some experience of really high peaks. See our Firsts page for details of the first scents ANDES groups have made over the years of many 5000m and 6000m peaks in this area of the Andes. 1. First Ascents Expeditions. We have run many previous "First Ascents" trips to the Puna de Atacama, most recently in March 2016 and January 2018. We have a new "Argentina Unclimbed" expedition scheduled for December 2018 to an area in the northern Puna. In November 2011 we had a very successful trip when we reached the summits of three unclimbed 6000m peaks. We can do this sort of trip again, to other unclimbed 5500m+ peaks (and maybe even one or two more over 6000m peaks). Trip lengths can be from 18 to 25 days. Please call or email us for further details and a quote. For photos of some previous successes see our Firsts page. 2. A 22 to 28 day expedition to climb Ojos del Salado and Pissis from Fiambala in Argentina. These are the 2nd and 3rd highest peaks in the Andes and both are located in a beautiful scenic area above the Valle de Chaschuil. From Fiambala we will make a preliminary acclimatisation trip to this valley. Ojos del Salado from the Argentine side. 3. 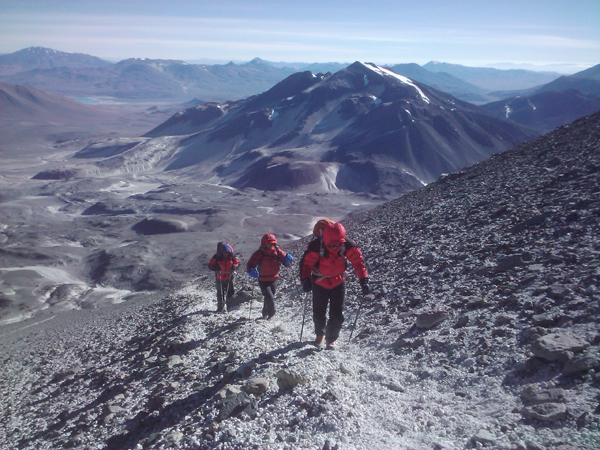 A 21-24 day expedition to climb Llullaillaco from northern Chile, 6739m. We have this expedition scheduled for December 2018. This peak was climbed over 400 years ago by the Incas and there are impressive ruins just under the summit, including houses, platforms and staircases. In the past we have climbed other lower peaks such as Licancabur or Pili as an acclimatisation peak. 4. The wonderful Nevados de Cachi, accessed from the town of Salta and the sleepy wee village of Cachi. Beautiful cactus fields and startling desert canyons make this a very special part of Argentina. We most recently ran a trip here in August 2012. 5. The very high peaks of Ojos del Salado and Tres Cruces can be climbed from the beautiful Laguna Verde on the Chilean side of the mountains. There are many other good 6000m+ peaks to climb in this area as well. These trips are generally based out of the small city of Copiapo in northern Chile. We have run several successful expeditions form the Chilean side before, most recently in March 2016. At about 6700m on Ojos del Salado summit day, looking over to the peak of El Muerto, Chile. Please contact us for further information or detailed itineraries.